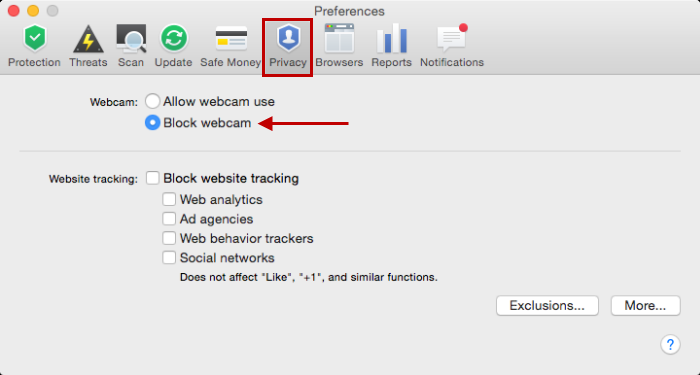 The Webcam protection feature in Kaspersky Internet Security 16 for Mac prevents applications from accessing the Mac’s webcam. By default, Webcam protection is disabled. Webcam protection does hot have any exclusions settings for specific applications. If the feature is enabled, access to the webcam is blocked for all system and user processes. Open Preferences in Kaspersky Internet Security 16 for Mac. In the Preferences window, go to the Privacy tab. In the Webcam section, select the option Block webcam. When Webcam protection is turned on, Kaspersky Internet Security for Mac 16 starts blocking new attempts to access the webcam. Applications that were already using the webcam will be blocked upon computer restart. Kaspersky Internet Security 16 for Mac blocks access to built-in and external webcams included into Apple’s proprietary libraries. To stop applications from accessing the webcam, Kaspersky Internet Security 16 for Mac blocks access to these libraries. Support of external webcams is not tested and cannot be guaranteed by Kaspersky Lab.